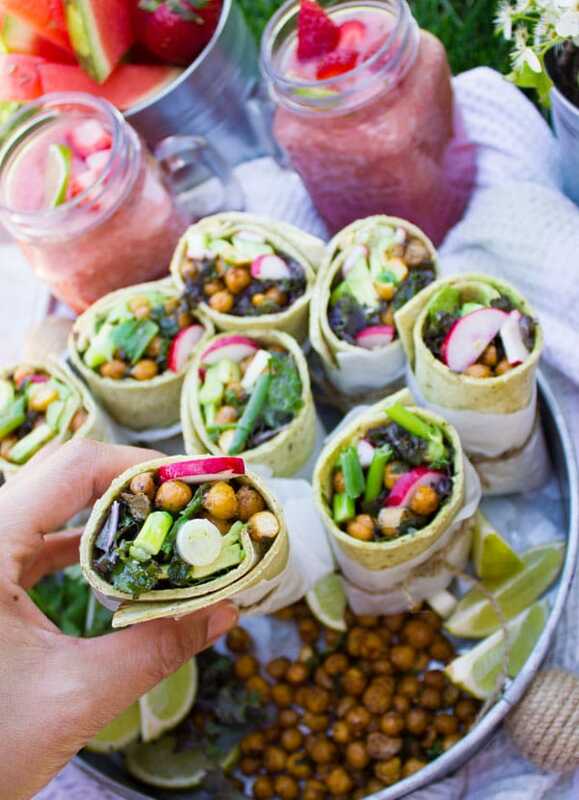 These Roasted Chickpeas Wraps are packed with plant-based protein and healthy veggies! 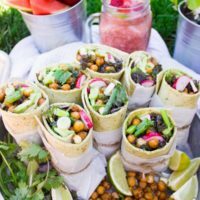 A touch of hot sauce adds some heat to these vegan wraps! The perfect make-ahead lunch to take to the office or on a picnic. Today, it’s all about roasted chickpeas. 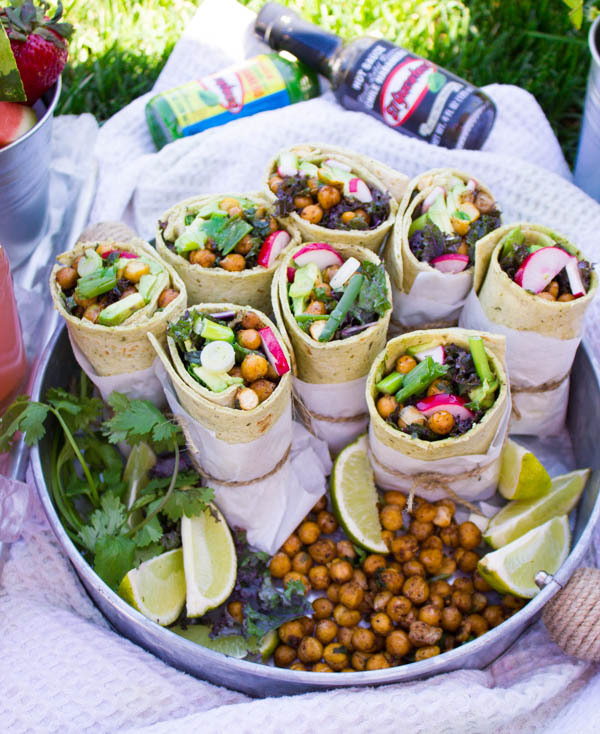 They’re not only awesome in these roasted chickpeas wraps, they’re also addictively awesome to snack on all day! Plus they’re a great healthy high-protein addition to your salads, soups, sandwiches, pizzas (YES), or pasta..you name it! 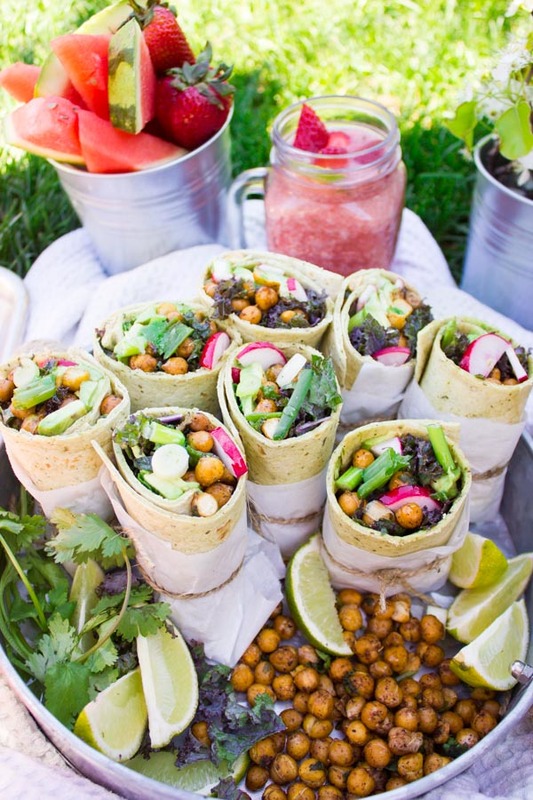 The roasted chickpeas add the bulk of flavor and texture to these healthy vegetarian wraps. They’re slightly spicy, crispy, filling and hearty. And they’re super nutritious too! So it’s a win-win. 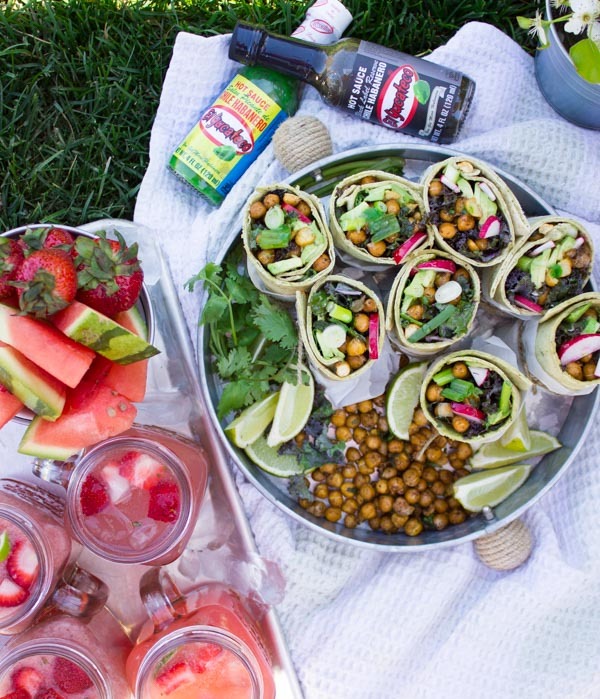 I love those vegan wraps for picnics, beach trips, school lunches and office lunch! Your co-workers will be so jealous! In a large bowl add all the chickpea ingredients except for the cilantro. 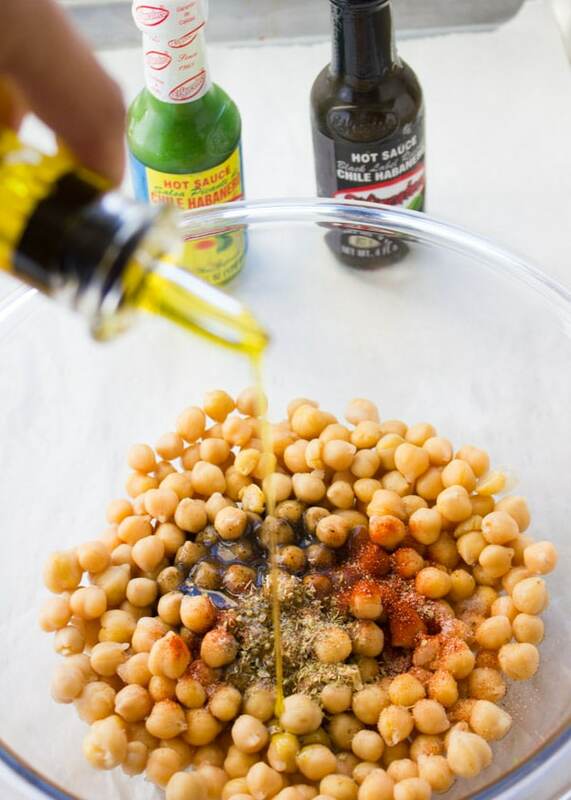 Toss well to coat and spread the chickpeas in a single layer on a baking sheet (lined with parchment paper). 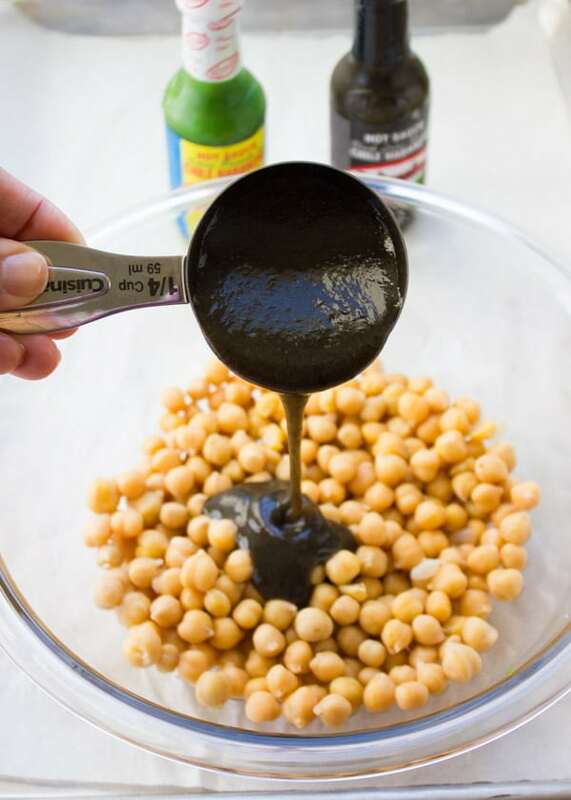 Roast the chickpeas for 25 minutes (stirring frequently to make sure they roast evenly). Once the chickpeas are done, allow them to cool slightly before starting the wraps. There are a bunch of ways to do roasted chickpeas, I love a high heat oven for less time. This works especially well here because I’m adding Hot Sauce to them, so they soak up all the sauce and roast perfectly. Finally, let’s assemble the wraps. 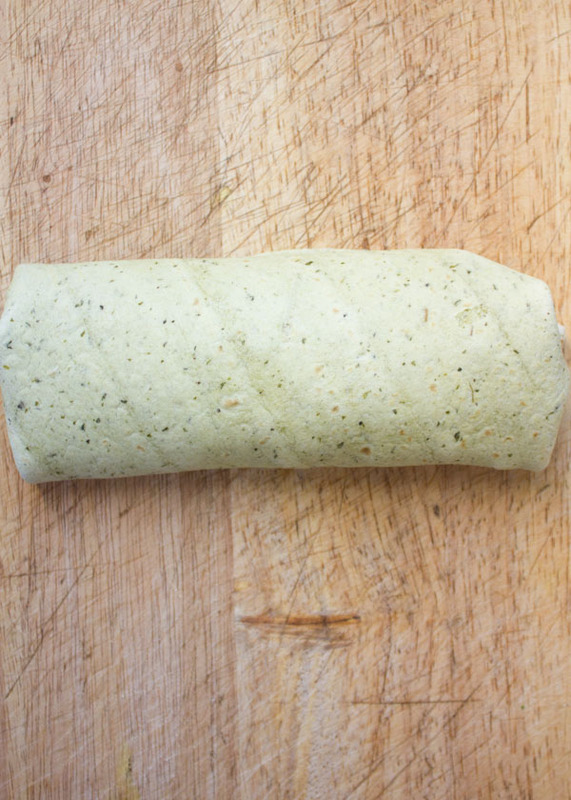 You can play around with your favourite wrap ingredients! Swap some stuff around, add more of something, take another thing off completely. You can’t go wrong! 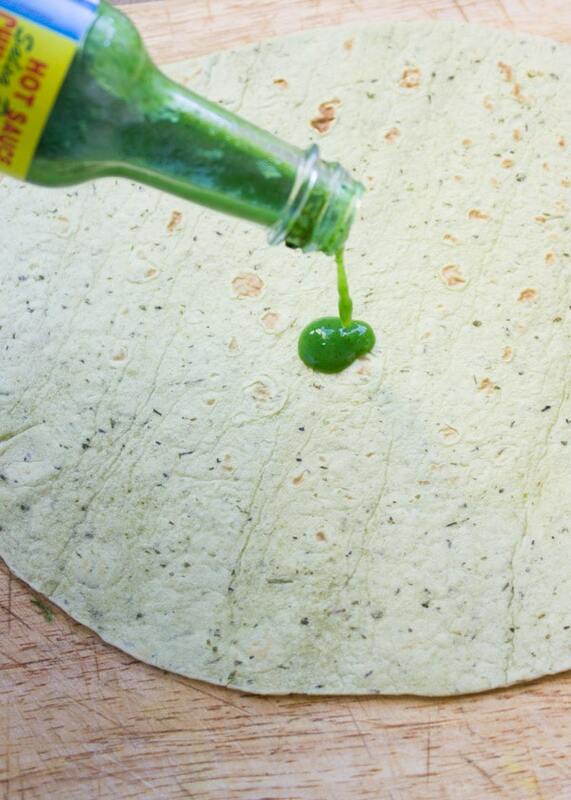 Start by spreading some hot sauce on top of your tortilla. I went with a mix of purple kale, roasted chickpeas, sliced radishes, sliced avocados, scallions and a squirt of lime. Roll up, cut in half, tie with paper and pack to go! 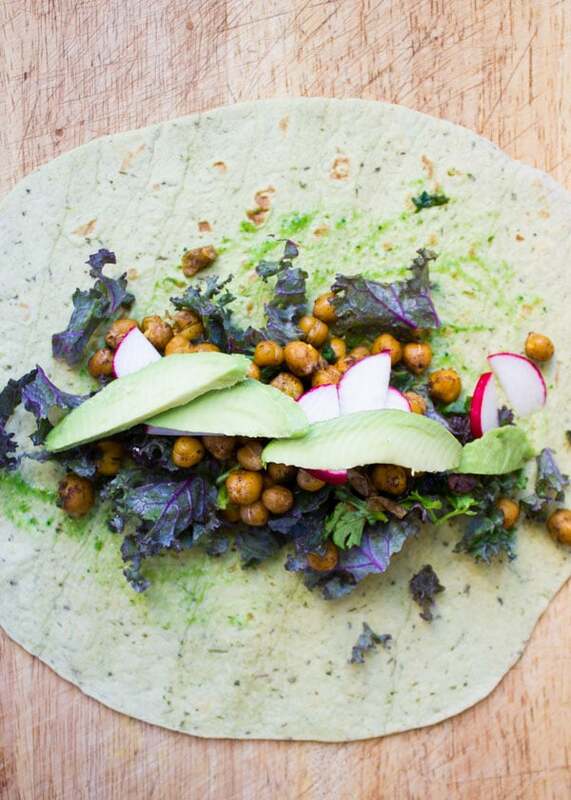 This roasted chickpea recipe makes wraps that are healthy, high in plant-based protein and 100 % vegan and you won’t miss a dollop of mayo in here, they’re filling and hearty enough thanks to the roasted chickpeas! 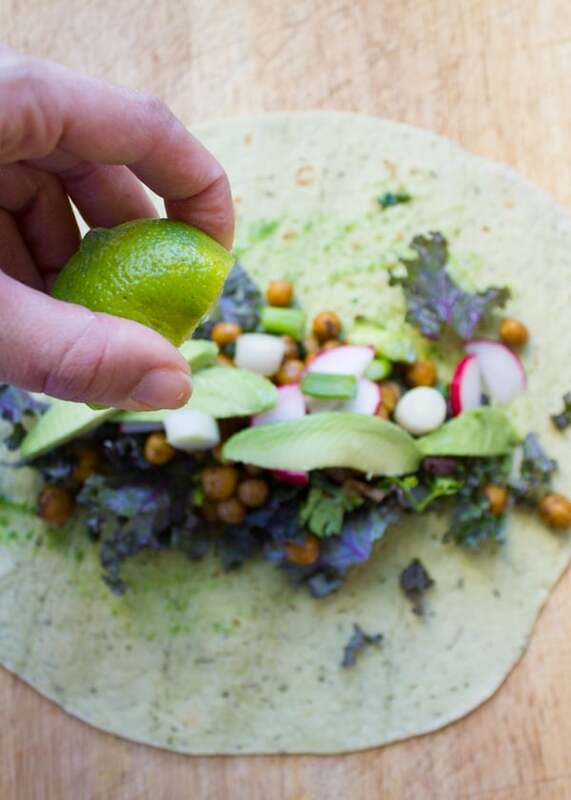 Add a tablespoon of vegan mayo to these roasted chickpeas wraps for a bit of creaminess! Use your favorite veggies for the wrap filling and adapt the amount of hot sauce to your personal taste. 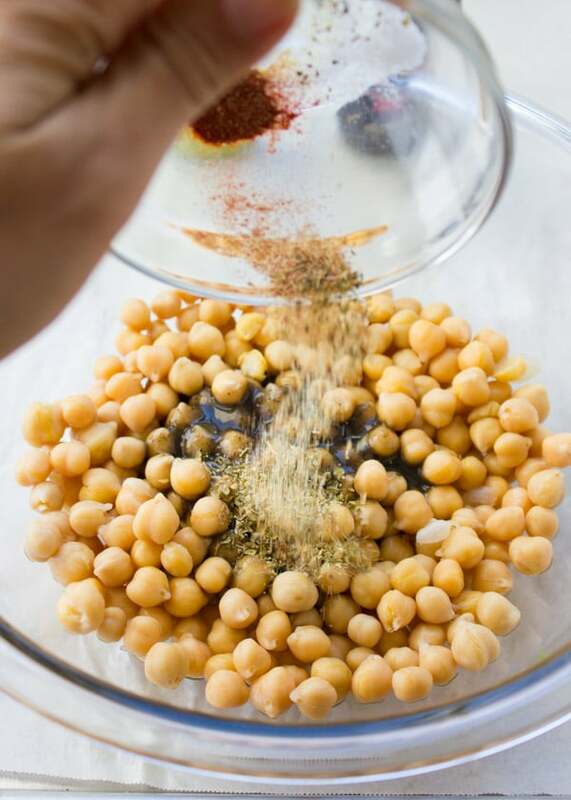 While the chickpeas are roasting, make sure to stir them every once in a while to allow for even roasting! In a large bowl add all the chickpea ingredients except for the cilantro. 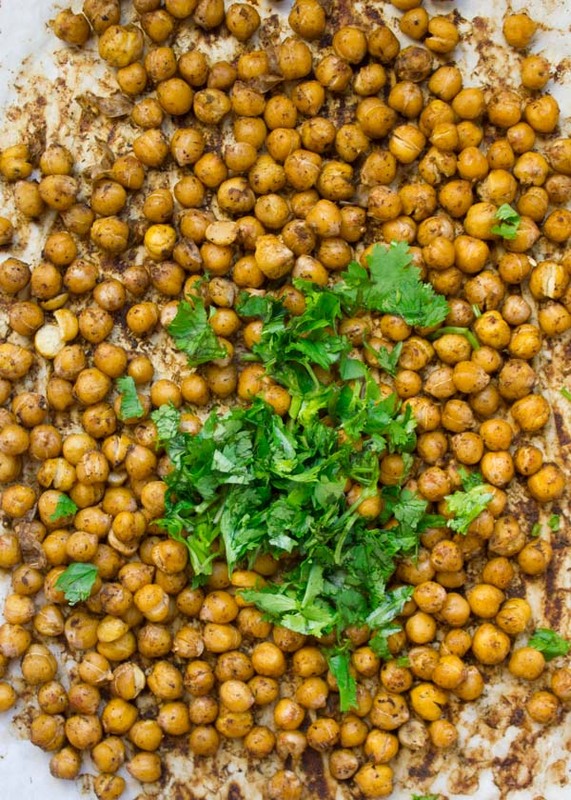 Toss well to coat and spread the chickpeas in a single layer on a baking sheet (lined with parchment paper). 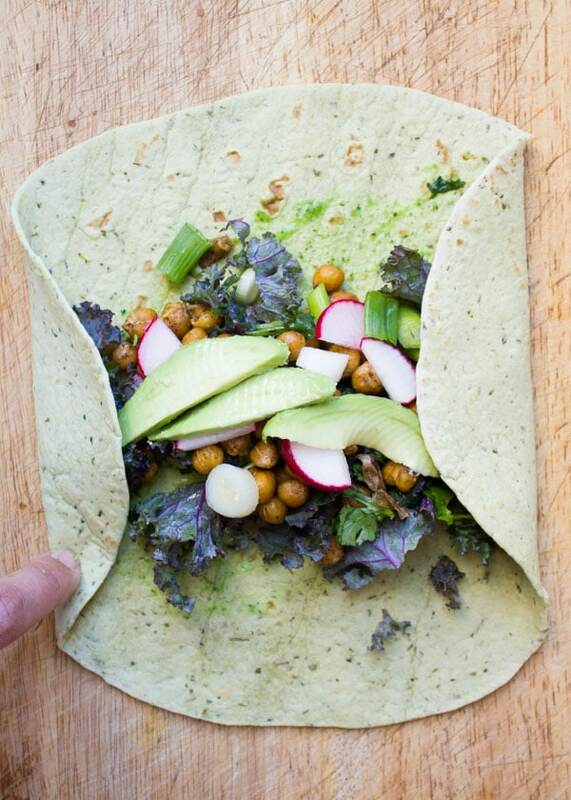 Place a tortilla on a flat surface and spread with the hot sauce, add the kale along the centre of the tortilla. Pile the remaining toppings over the kale along the centre of the tortilla too, leaving an inch clearance on the both sides. gently fold the sides of the tortillas over the filling before you tart rolling (that way the filling doesn’t fall off the wrap), and then start rolling the tortillas. 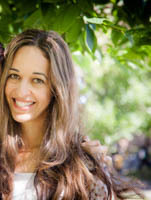 Thanks so much Adriana! You’ll absolutely enjoy them 🙂 Loved being part of this shop! 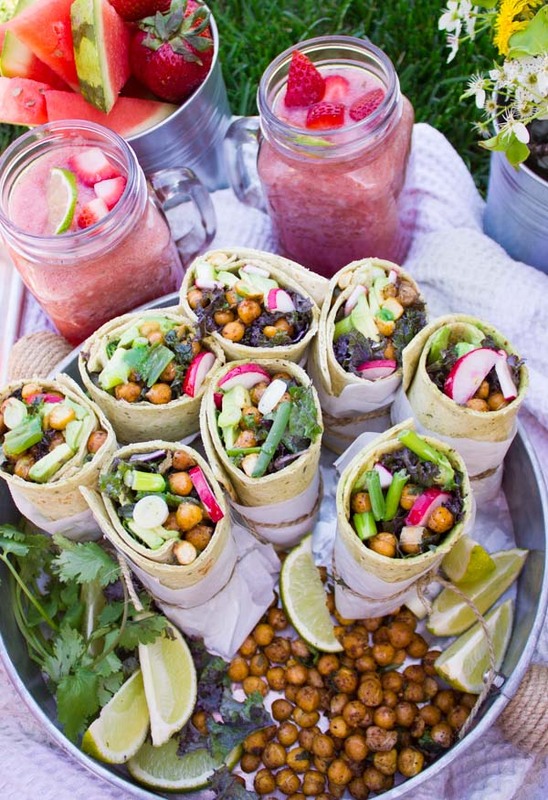 Roasted chickpeas in wraps sounds like great idea, protein rich warp. I need to give it a try.